Happy Monday! Hope you had lovely weekend! Mine was great. I spent my Saturday morning selling some of my craft supplies on a craft sale organised by my local craft store called Scrapbook Store. I did sell a few stamp set and dies but I made new friends. Weather threatened to rain. No actually it did rain twice during the sale. We had cover everything and duck undercover as well. lol! It was a great time. There will be one more end of November. I let you know about the final date and time in couple of week. If you are in Perth and would love some craft supplies, please do come. Rest of the weekend I spent gardening, washing and crafting of course. 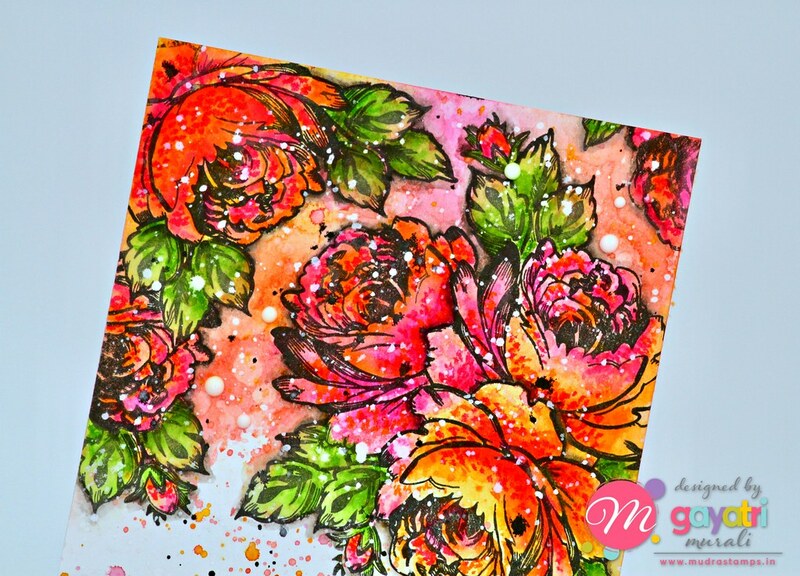 So I made this card using Mudra stamp set called Sweet Rose. It is a beautiful layered stamp set. 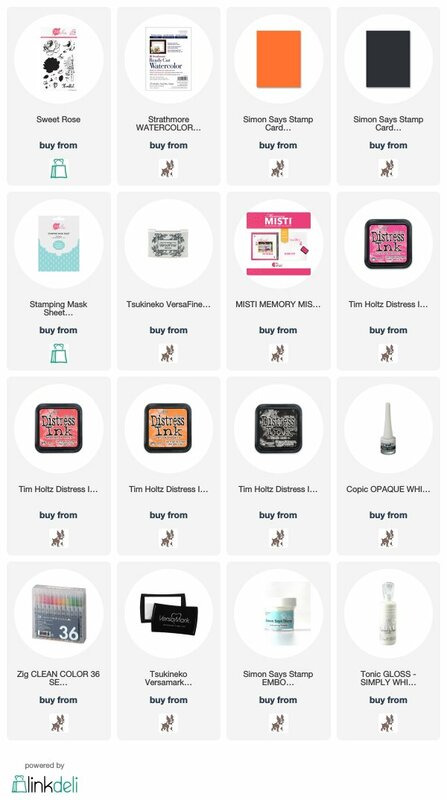 This is one of their new release this month and I LOVE this set. 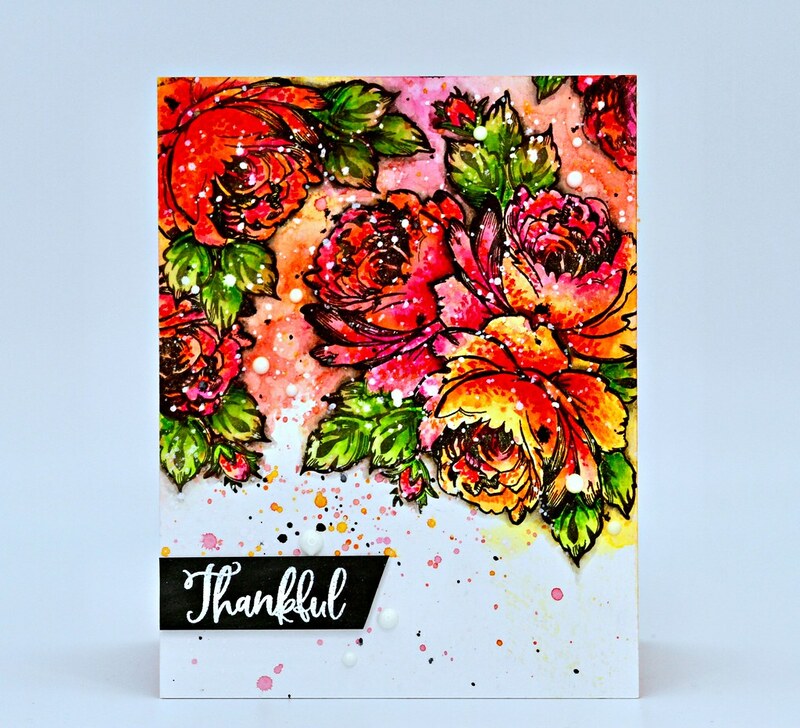 This card has distress inks on the background. 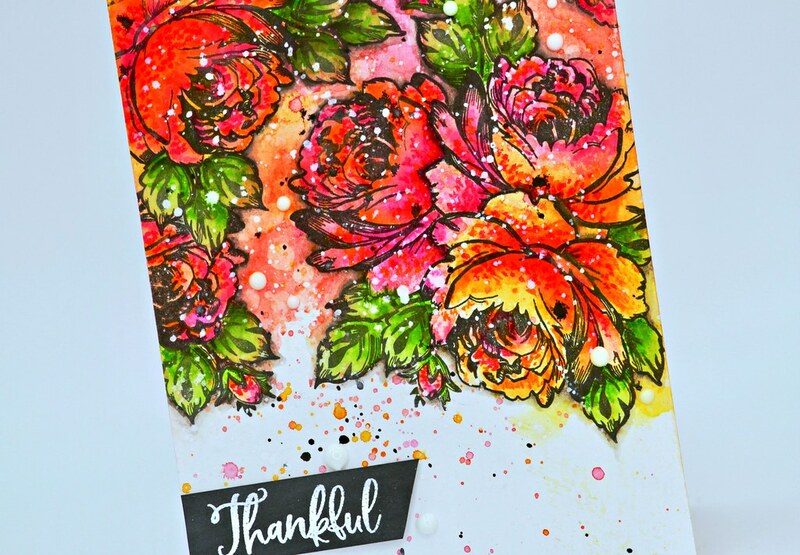 I used Carved Pumpkin, Abandoned Coral and Picked Raspberry distress inks and I used Ink smooshing technique to add colour to the watercolour panel. The using MISTI and masking technique I used the outline images of the rose and leaves to stamp a larger cluster and a few images around the clusters to fill in the top two thirds of the watercolour panel where I smooshed the distress inks. Phew! That was a very long sentence. Then I added colour, shading and texture to the stamped images using Clean Color Brush Pens. Once dry, I spattered the same distress ink colours, distress ink black and Copic Opaque white all over the panel. I left the panel to dry while I worked on the sentiment. 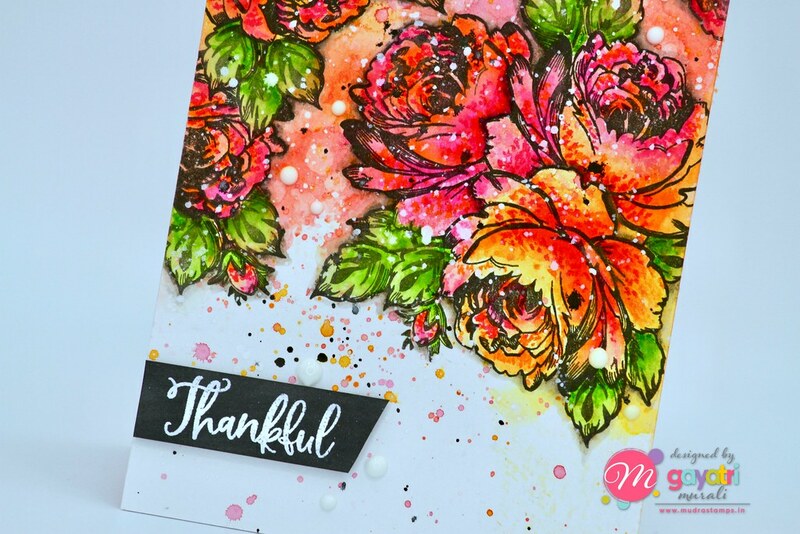 Because the background is bright, vibrant and colourful, I kept the sentiment simple by heat embossing the sentiment from the stamp set on to a strip of black cardstock, trimmed and adhered on the bottom left of the panel. The whole panel is adhered to orange card base. Finally I added a few white Nuvo crystal drops on the panel randomly. 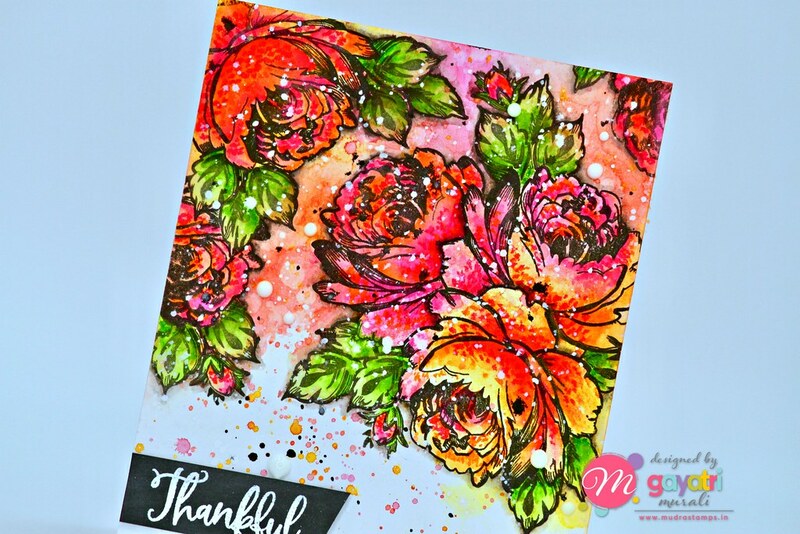 Hope you like my card today using Mudra’s Sweet Rose stamp set.